The hard drive to my laptop failed in late September. At that time I had used EverNote two times. Being without a primary computer, and pretty much spending 85% of my waking hours in the library, I tried the online version to see if it could keep up with my hectic, computer hopping lifestyle. It could not. Frequently moving between Mac and PC, laptop to desktop, I found the learning curve to be greater and the extra log-in less convenient than, what has become my absolute stand-by for any and all long-term projects: Google Drive. Google Drive is bare bones file storage and basic file creation, but it allows users to create the infrastructure that they are most comfortable with and files that can be transferred and used with any Microsoft Office software. 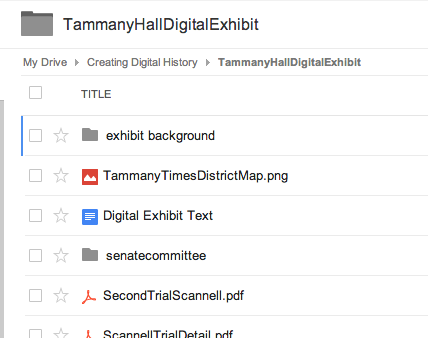 I wanted to use video to tell the story of murder within Tammany Hall. This requires very specific and expensive software that was on my computer, so I spent most of the semester gathering material and researching the topic. Most of this was in the form of New York Tribune and New York Times articles found via the library’s ProQuest database. A lot of these articles went into Google Drive, however, some of them I just printed out and kept with me for quick reference. I find it much easier to flip through pages than I do to scan through PDFs. When it finally came time to include these in the exhibit, I needed only to do a quick keyword search and download the file in order to access it. Admittedly, this is not the most centralized or organized approach in the world, but it is how I am accustomed to working and it seems to get the job done for me. It is difficult to find a single program or software that offers you every function and application necessary to do a research project. I think some programs are better suited to some functions than others. Because there are so many programs that do one function really well, I’m not sure it’s necessary, or even more convenient to have one program that does every function only so-so. I use Google Drive because I use many computers, but I also use the library databases as if they were personal hard drives because it’s easier to do a keyword search than it is to go through subfolder after subfolder to find a particular file. I’m sure EverNote works well for a lot of people, but it didn’t fit with my particular methods for researching and creating a project. I think this is why we have so many different programs available – there is a person for every application and an application for every person. It’s just a matter of finding the one that fits. Evernote is a great note taking software that really helped me both organize my research and prepare a narrative for the GVHDA web exhibit. Its flexibility – which allowed me to make “notes” of my own creation or capture full webpages, excerpts of websites, and images on websites – enabled me to keep a constantly-updating archive of materials necessary for constructing a well-researched final project. I had never used a digital service or software for note taking before enrolling in this class. I usually rely on my Gmail account for organizing web links and drafts of my writing. Using it as a storage space ensured that my work would never be lost and that I could continually revisit resources and my own research from my cell phone, tablet, laptop, and any computer with an Internet connection. There are, however, some problems with organizing research in my inbox. Beyond labeling each email with the name or kind of information I stored within it – “draft introduction,” for example, or “New York Times article on Second Avenue” – there is no function for sorting the information that I was keeping and creating. Websites in particular posed a problem because each email simply contained a link with no preview of the actual content. I also had trouble distinguishing between classes when using my email account, making it difficult to keep track of multiple research projects each semester. A screenshot of my Evernote homepage. The tags I used in my Greenwich Village Digital History Notebook. As a result, Evernote is a welcome change in the way I conduct research and it solved all of the issues that I had with storing my work online. I can easily access it using the application that I downloaded to all of my devices or through the Evernote website on any computer. I can also sort my resources using tags of my own creation, and I have made different notebooks for the various projects that I’m working on this semester. The most helpful aspect of Evernote is its tagging capability. As an Internet user familiar and comfortable with tagging, it is great to be able to impose a frame on and implement tags relevant to my research. After making a notebook for our Greenwich Village History class, I classified my notes into various categories. I tagged my comments on our readings and work done in class as “Class Notes.” Materials that I wanted to upload as items for the digital archive were either tagged as “Digital archive” (if I had permission to use them or they were in the public domain) or as “Digital archive?” (if I was in the process of gathering permissions and their status was still uncertain). I created my own notes containing proposals for the exhibit’s layout and drafts of exhibit pages, tagging them all as “Exhibit Planning.” Any resources that I planned to use more broadly for exhibit content were simply tagged “Research,” while more specific clippings I organized using unique tags – “CUANDO” or “Cooper” – relevant to my project. I also really enjoyed using the Evernote clipper. It made the research process a lot easier and more efficient, allowing me to quickly save webpages, articles, and images directly to my notebook of choice. I most appreciated the tool when I was working within NYU’s subscription-based databases. 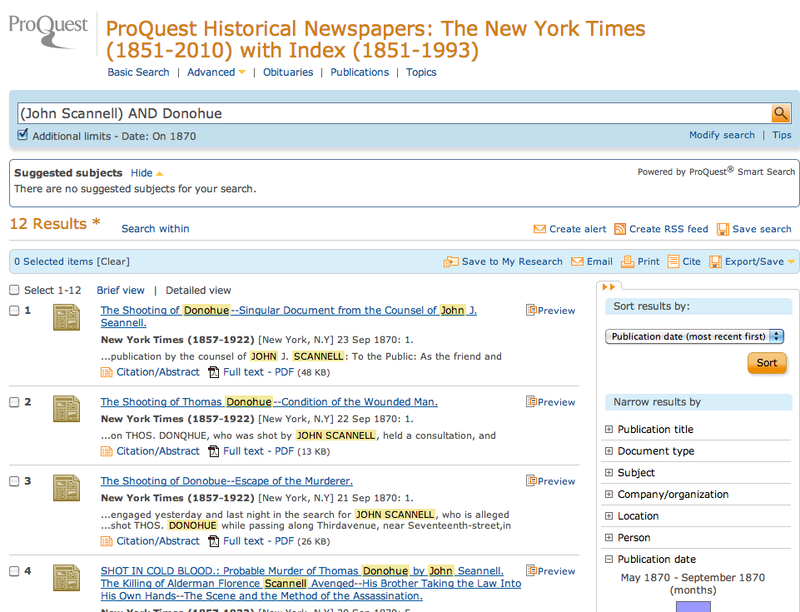 A good amount of my primary source research for the exhibit was conducted in ProQuest’s historical archives, which I cannot access unless I am logged into my NYU account. Clipping the entire article webpage with Evernote, however, allowed me to view PDFs of the material, even when I was on a device or computer that was not logged into NYU. A blank clipped page from a Google Books search. The clipper was less helpful when I clipped Google Books resources. I usually began such searches in Google Scholar with targeted search terms that led to specific pages in books and journals. 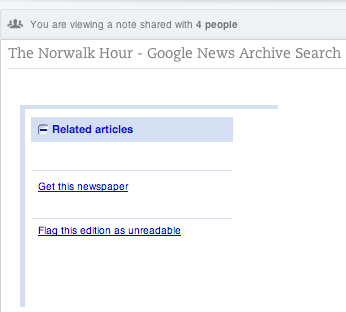 The clipper, however, is unable to “clip” the webpage so the note for any Google resource is therefore an empty page. I also had some issues immediately tagging resources while clipping. The software ran slowly when I did so and often assigned my most-used tag to the resource instead of allowing me to select the appropriate tag myself. I then needed to open the application, manually remove the incorrect tag, and reassign the material the tag I originally intended to give it. As a “free” service user, I’m limited to 60 MB of files every month. This is not an issue now – I still have 59.6 MB of space remaining before my allowance is updated – but can become problematic if I begin to rely on the service for all of my research and work-related projects. 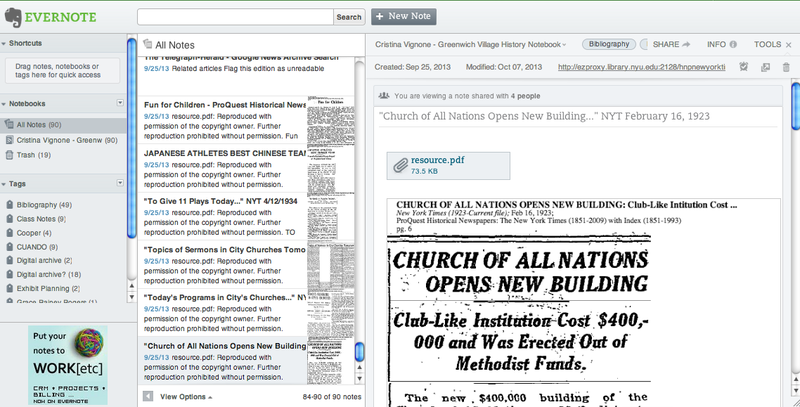 I really appreciate Evernote as a research tool. It replaced the previous way that I assembled materials online, enhancing the process by allowing me to better sort and save my research. Gathering digital information relevant to my work is much simpler with Evernote because of its tagging capabilities and clipper tool. Being able to plan and draft my writing in the same place that I store my class notes also assisted me in better organizing the assignments that I needed to complete. Overall, Evernote made a potentially overwhelming research process both more feasible and enjoyable. The Greenwich Village Theatre only existed for thirteen years, but within that time frame the institution established a lasting legacy within the theater world and in Greenwich Village. Originally designed and built by New York architect Herman Lee Meader, the 500-seat theatre was a landmark of Greenwich Village from 1917 to 1930. Located on the west side of Seventh Avenue South between Christopher and West 4th Streets overlooking Sheridan Square, the Greenwich Village Theatre was originally built for the Greenwich Village Players, an acting troupe founded by Frank Conroy and featuring a young Clare Eames. The Greenwich Village Players reflected the prevalence of “little theatres” during the teens, in which theatre enthusiasts transformed into amateur actors and playwrights and eventually theater professionals. Despite being known as a locale of bohemia and radicalism, Greenwich Village was also a popular tourist destination during the 1910s and 1920s. The area of Sheridan Square was particularly popular among tourists, due to the development of the west side subway line in 1918. Originally published in the Saturday Evening Post, Sinclair Lewis satirized the influx of tourists in “Hobohemia,” a short story that he adapted into a play that ran at the Greenwich Village Theatre in 1919. The play features the characters of Mr. Brown and Mrs. Saffron. Mr. Brown “decides the only problem with bohemia is that the bohemians don’t know how to make a profit from it,” and encounters Mrs. Saffron, a parody of Mabel Dodge, in Greenwich Village. Lewis’s play satirized prominent Greenwich Village figures, who he clearly thought were taking themselves too seriously. This transition from the serious bohemian theatre troupe of the Greenwich Village Players to an increased willingness to parody themselves set the stage for the Greenwich Village Follies. The Greenwich Village Follies premiered on July 15, 1919 at the Greenwich Village Theatre. Though initially titled “Greenwich Village Nights,” this was quickly changed to the Follies; facing off against the popular Ziegfeld’s Follies. Created by John Murray Anderson alongside lyricist Philip Bartholomae and composer A. Baldwin Sloane, the musical revue more than held its own against Ziegfeld’s Follies. Praised by the New York Times, particularly for its “melody and beauty,” the 1919 Follies emerged as a hit. Much of the scenes and songs of the Follies parodied Greenwich Village life and current events. Bessie McCoy, the Broadway veteran, sang, “I’m a Hostess of a Bum Cabaret,” satirizing Prohibition, while other songs like “I’ll Sell You a Girl,” poked fun at bohemian concepts such as free love. Following the success of the 1919 Follies, Anderson produced another series of shows in 1920 that played at the Greenwich Village Theatre. However, the 1920 Follies greatly resembled a Broadway musical revue, and the show moved to the Schubert Theatre on Broadway a month after it opened. The Greenwich Village Follies played for six seasons on Broadway and became less associated with the Village after its second season. Despite only running for less than two seasons in Greenwich Village, the legacy of the show has lasted. In 2011, a musical revue detailing Greenwich Village history billed itself as “The Greenwich Village Follies.” The show, performed at Manhattan Theater Source on Macdougal St., covered local history from the 1700s to the Stonewall rebellion in 1969. 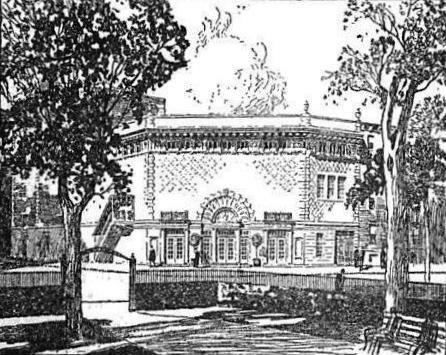 After the departure of the Greenwich Village Follies, the Greenwich Village Theatre remained a landmark of Sheridan Square and the Village until 1930 when it was demolished. Bordman, Gerald. American Musical Theater: A Chronicle. Oxford University Press: 2001. Gates, Anita. “From George Washington to Beatniks and Beyond.” NY Times, Jul. 3, 2011. Hischak, Thomas S. Off-Broadway Musicals since 1919: From Greenwich Village Follies to the Toxic Avenger. Scarecrow Press: 2011. Strausbaugh, John. The Village: 400 Years of Beats and Bohemians, Radicals and Rogues, a History of Greenwich Village. Harper Collins: 2013. St. Vincent’s Hospital in Greenwich Village was not just a place of employment for nurses, but it was also a place for education. 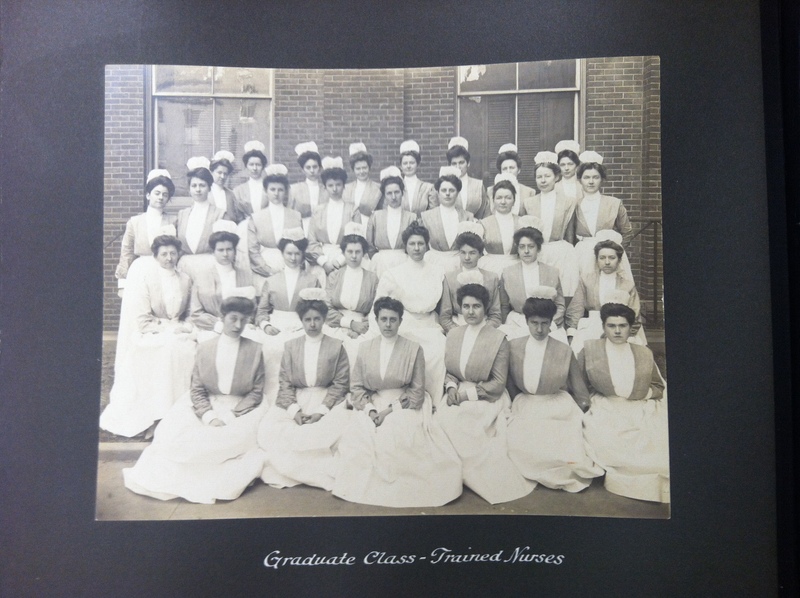 In 1892, forty-three years after the hospital’s opening, the St. Vincent’s School of Nursing opened its doors to women. The school was first directed by Katherine A. Sanborn. Many graduates from this school continued their work at St. Vincent’s hospital. Other graduates went to work elsewhere in New York City, including the New York Foundling Hospital, another institution directed by the Sisters of Charity. Eventually, in the 1930s, St. Vincent’s School of Nursing began to accept men. This produced even more graduates and more St. Vincent’s educated nurses working in the field. Soon after, the United States found itself on the brink of war, resulting in a high demand for nurses. St. Vincent’s Hospital was one of the first New York institutions to react to a wartime United States. St. Vincent’s lost many nurses who desired to fulfill their patriotic duty and went overseas to care for the wounded. Those who remained in New York City took part in rationing, and practiced air strike drills. St. Vincent’s nurses also collected blood and plasma during the war, as it became one of the centers for the New York City Blood and Plasma exchange. The hospital became a site for draftee examinations. Over five hundred men were sent to Greenwich Village to be examined by the doctors and nurses at St. Vincent’s. In 1941, St. Vincent’s and the School of Nursing became a center for the U.S. Nursing Cadet Corps. The U.S. Nursing Cadet Corps was “the nation’s first integrated Uniformed U.S. Service Corps.” The nurses in the Corps were a vital entity on the home front, taking the jobs of their counterparts that were sent to Europe. According to the U.S. Nursing Cadet Corps website, their nurses made up 80% of nursing care in the United States by the end of World War II. While the U.S. Nursing Cadet Corps was making St. Vincent’s their newest home base, the hospital established their own Volunteer Corps. Mrs. Edmund Borgia Butler, an influential woman involved with the Catholic Board of Charities, brought life to this Volunteer Corps. Mrs. Butler selected the thirty initials members, but by the end 1943, the Corps had over seven hundred members who were working within the hospital, filling any vacant jobs. The Volunteer Corps played an integral part in the continued success of the hospital. The hardships of war did not prevent St. Vincent’s hospital from existing as a functioning institution. The end of the war marked a great transformation for St. Vincent’s Hospital. The hospital was growing physically with new building projects. It was also expanding its influence with the growing number of nurses that were being educated at its school and working in its wards. St. Vincent’s was no longer considered just a hospital, but rather St. Vincent’s Medical Center. The events of World War II are testament to the great reliance that was placed on not just the men who were fighting the battles, but also the people who were there behind the lines taking care of them. The nurses of St. Vincent’s, as well as other nurses across America, had a significant impact on society and the places that they worked in. Today neither St. Vincent’s Medical Center or the St. Vincent’s School of Nursing remain open, but their influence and memory is still with the many New Yorkers who walked through their doors in Greenwich Village. For more information on St. Vincent’s School of Nursing check out their alumnae website. St. Vincent’s Hospital and Medical Center, An Illustrated History, 1999. In the documentary The Tao of 9 Second Avenue, architect John Shuttleworth states that the Church of All Nations “was always a community-oriented building…[cutting] across ethnic boundaries.” He continues to recount that it inherited a “great history of community service,” beginning in 1874 when the Germania Assembly Rooms occupied the site at 9 Second Avenue, then alternatively known as 291 Bowery. Excerpt from ‪The Manhattan Guide‬: ‪Greater New York Red Book‬. The Germania Assembly Rooms, which are included in The Manhattan Guide’s list of the public halls of greater New York, functioned primarily as a settlement house for German immigrants. 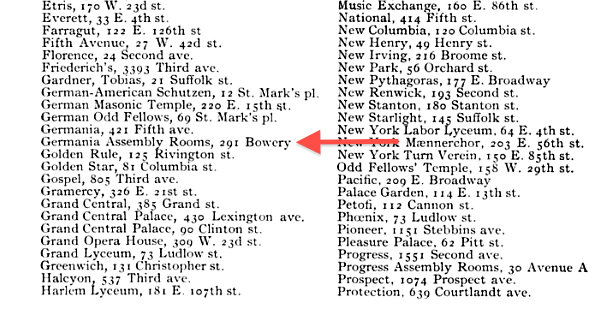 In his King’s How to See New York: A Complete Trustworthy Guide Book, Moses King calls the institution “a dance and meeting hall.” The Telegraph Herald adds that members of the Arion Singing Society used the Germania Assembly Rooms as a communal space. Excerpt from King’s How to See New York: A Complete Trustworthy Guide Book. 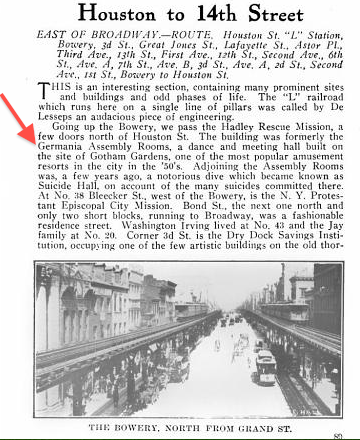 After its official opening at 9 Second Avenue on February 15, 1923, the Church of All Nations continued to provide services to the local community. Many interviewees in The Tao of 9 Second Avenue echo Shuttleworth’s comments, noting that the Church accepted and embraced people of all races and religions. Members could attend religious services in its chapel, which were given in Polish, Chinese, Russian, and English. According to Judy Sutula, a local synagogue even used the chapel for its Passover celebrations. Excerpt from The New York Charities Directory . The New York Charities Directory chronicles other activities hosted by the “settlement house,” including the Church’s English, Yiddish, Italian, Chinese, Russian, and German events. It also offered educational classes and kindergarten for young children in addition to gymnastics and sewing school. The Church’s “Fresh Air Fund vacations,” funded completely through donation, sent city children on free summer getaways in June, July, and August. In 1951 the New York Times advertised free puppet shows and demonstrations hosted by the Church’s Pioneer Youth Camp Program. Older Church of All Nations members could take part in theatre performances, which were either presented as part of the works division of the Department of Public Welfare or held as fundraisers for the Church. 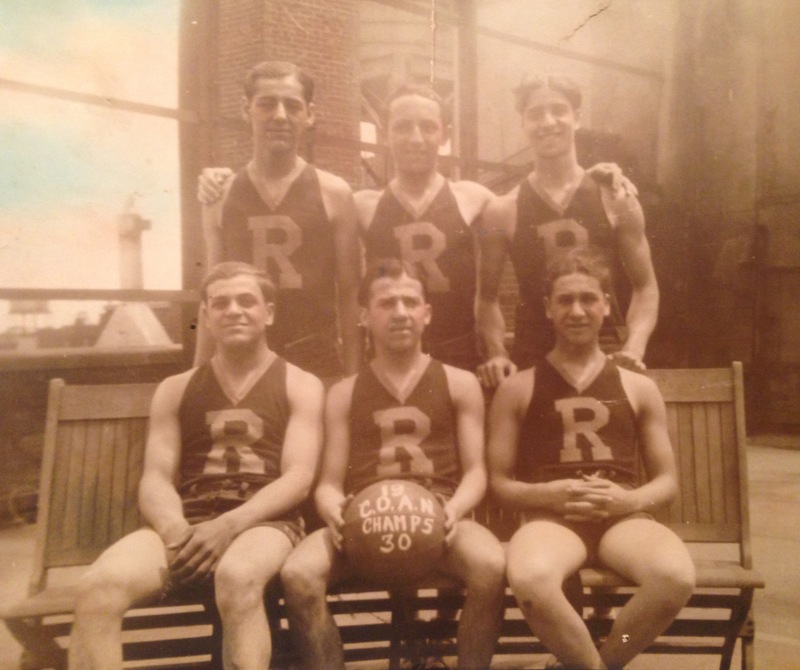 Church of All Nations members in their athletic uniforms. Photograph courtesy of Gloria Weilandis. Local athletics clubs, like the Chinese Athletic Club and the Young People’s Christian Foundation, used the building’s sports facilities for friendly games. 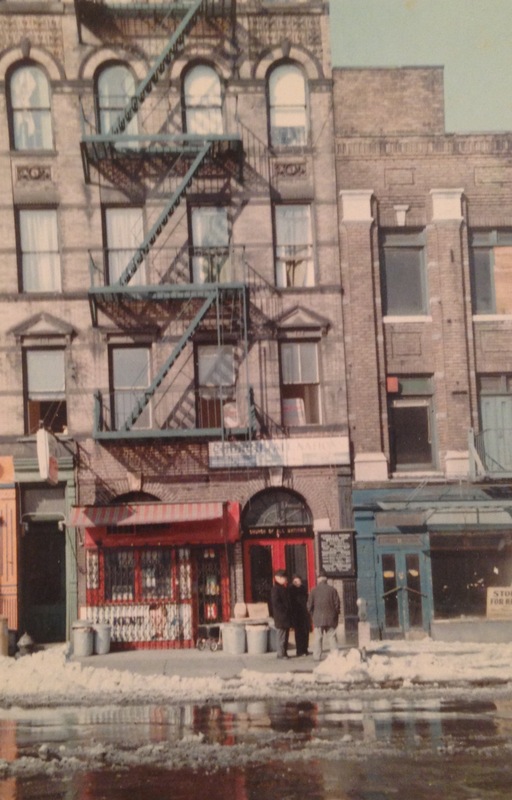 A rent-control station opened in the Church in 1947, allowing Lower East Side tenants to get information about their landlords and apply for rent reductions. Excerpt from “‪RISE IN MILK PRICE TO BE FOUGHT HERE; Consumers’ Protective Group Calls Public Meeting for Oct. 11 to Plan Action‬” article in the New York Times. The Church of All Nations also served as a forum where local residents could voice their opinions and exchange ideas about particular issues. In 1928 Russian members attended a speech on Christianity, communism, and materialism hosted by the Reverend Dr. Timothy Peshkoff, the Church’s Russian pastor. Union laborers on strike over low WPA wage scales gathered in the building in 1935 to send a telegram to Mayor LaGuardia refusing to return to work. 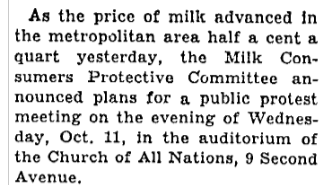 When the price of milk increased by half a cent in 1939, the Consumers’ Protective Group called a public meeting and planned a protest in the Church’s auditorium. Image of the Church of All Nations taken in February 1967. Photograph courtesy of Gloria Weilandis. The Church of All Nations was not the only institution committed to community service in Manhattan in the early part of the twentieth century. Much like other organizations listed in The Manhattan Guide and The New York Charities Directory, it supplied essential social, health, and religious services to local residents. The Church of All Nations also provided its members with a space to form and strengthen communal bonds, which permanently ceased with the building’s demolition in 2005. Greenwich Village is known worldwide as a bohemian incubator of radical intellectuals, radical performers and radical political activists. This exhibit looks at some of that history. What’s left when a great writer moves to another place? Not much, but we can examine the door he or she walked through every day, try to imagine what the neighborhood was like at the time, knowing that the real legacy is in the work. At the heart of Greenwich Village, Washington Square Park is a prominent and popular public space in lower Manhattan. Villagers fill the beautiful park to play, work, and gather around the fountain or iconic Washington Arch. But long before the park was officially dedicated as a city public place in 1826, many diverse groups inhabited the area and utilized it for different purposes. Washington Square’s history contains explorations and conflicts, celebrations and executions. Some remnants of this past can still be seen, and its interesting history helped shape the park and surrounding streets into the Washington Square we know today.